The 2014 Farm Bill included new ways for the USDA-Natural Resources Conservation Service (NRCS) created the Regional Conservation Partnership Program (RCPP). The purpose of the program is to promote coordination with partners to deliver conservation assistance to agricultural producers and landowners. Through RCPP, NRCS and its partners provides technical assistance through agreements and direct funding for conservation practices. Through Thames River Basin Partnership meetings, partners meet to discuss ways to collaborate on projects like these. FY14/15, (State level funding) The Last Green Valley lead partner in this $400,000 NRCS RCPP project entitled Improving Soil Health and Water Quality in the Thames River Watershed. This project addresses two national priorities (soil health and water quality), and all five Connecticut state priorities (water quality degradation, soil erosion, soil quality degradation, degraded plant conditions and livestock production limitations). 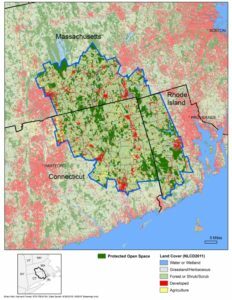 Utilizing the RCPP Program, four collaborating partners will implement soil health conservation practices through EQIP on cropland in eastern Connecticut’s Thames River Watershed. 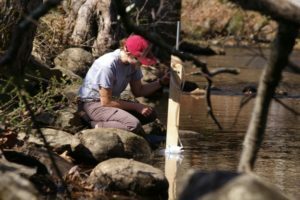 The long-term objective of this project is to show a measurable improvement of edge-of-field and in-stream water quality, including a decrease in nutrient and turbidity levels; thereby, improving soil health and water quality in the area. 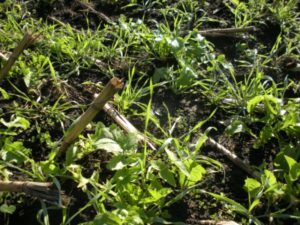 Potential conservation practices to reduce pathogens will include composting, nutrient management, residue and tillage management, cover crops, fencing, buffers and filter strips, vegetated treatment areas and wetlands. This project will incorporate cutting-edge research tools that will allow for the identification of species-specific DNA markers. This will allow the source of E. coli to be determined by which species contributed it, which in turn will focus remediation efforts where they are most needed. Jack Clausen of UCONN is the project lead for this project. FY16/17 (National level funding) The Last Green Valley (TLGV) was awarded $6,144,000 through the NRCS RCPP program for Accelerating the Pace of Conservation in the Southern New England Heritage Forest. The Southern New England Heritage Forest (SNEHF) is a uniquely-positioned forest corridor stretching north along the Connecticut and Rhode Island border to the Quabbin Reservoir in Massachusetts. Spanning the shared borders of the 2nd, 3rd and 4th most densely populated states in the country, SNEHF contains 68 towns and covers 1.49 million acres, of which a remarkable 76% still remains in forest and high-priority forested wildlife habitat. Between 2011 and 2017, federal and non-profit organizations conducted extensive forest landowner outreach in this region, establishing an informed network of “Woodland Ambassadors” and educated and engaged landowners interested in improving and conserving their forested properties. This SNEHF project will connect these forest landowners, who would not traditionally interact with the Natural Resources Conservation Service, with NRCS programs and services. A remarkable partnership of non-profit organizations and regional, state and municipal agencies will offer private woodland owners a suite of NRCS tools for sound management and forestry conservation practices through the Environmental Quality Incentives Program (EQIP) and permanent protection through easements under the Healthy Forests Reserve Program. This project will serve as a “conservation pipeline” of forest and bird habitat plans, EQIP practices and HFRP easements on private forestlands in order to accelerate the pace of conservation in SNEHF. For more information about USDA NRCS RCPP opportunities, please visit the NRCS website.